Hey guys, new member here. Been lurking for a couple of weeks and reading up. A friend has an Ascot that she'll never do anything with and I'm seriously considering grabbing it. Done plenty of vintage bike projects over the years, everything from XS650's to a KZ250 to a BUNCH of CB500/550's (my favorites). Plus, had a few more modern bikes, too. 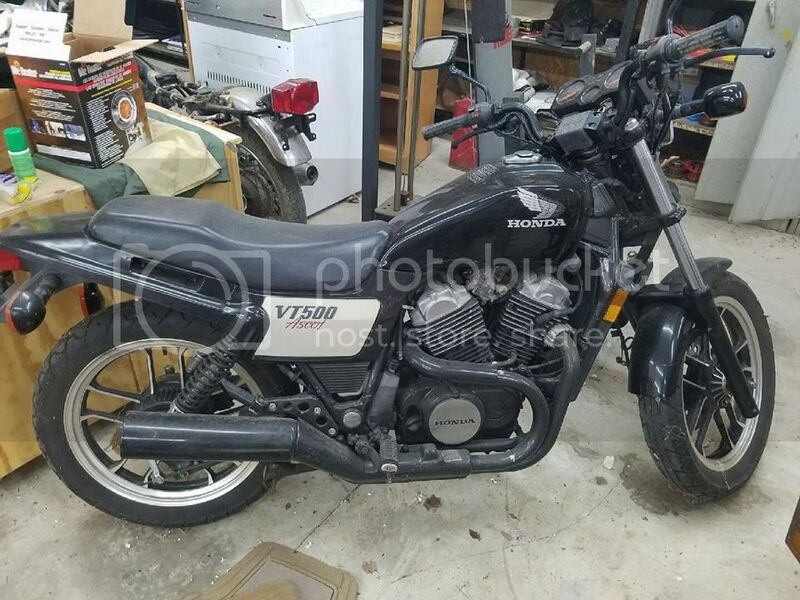 I'm a big fan of the Honda middleweights and currently have an '85 VF500F Interceptor and a '73 CB500/550 resto-mod. * Has swapping out the headlight been covered? I really prefer a round headlight or maybe a number plate type deal. And why in the world did Honda stick the stock light up so high!? * What's the O.D. of the stock exhaust pipe where you would bolt on a muffler? What about the O.D. on the header Thumperstuff sells? I have quite a few mufflers in my stash to choose from, just need to see if the I.D./O.D. match or are close enough to make an adapter. * I see a lot of people go with the digital dash gauges. Is that just for looks or are there known problems with the gauges? * Tell me what to look for when I get a chance to inspect this bike. I know, in general, how to inspect an old bike. But are the FT500 specific things I should look for? I know she said it needs caliper(s), but she couldn't say why. Just that she was told that when she bought it. No biggie, I just did them on the VF500 and they look similar. Any other things to look at particular to this model? I replaced the headlight on mine (as it had been damaged) with the round one from a modern (watercooled model) CB400/4. Look good and works well. Gauges are fine, pretty standard Honda stuff and can be repaired easily. Calipers on any bike will seize if left standing. Are a common size fitted to just about every Honda of the time from XR250 to CB1100R. The starter secondary shaft bushes fail and allow the gear teeth to get out of alignment. This is heard as a 'grating' noise when trying to start. Easily replaced with caged needle rollers and never again a problem. Check the cam chain and tensioner (it is a 80's Honda) as the teeth of the rachet in the tensioner wear down and allow the tension to slip. Easily replaced without taking engine from frame. Other wise they are a good thing (in my mind) so go enjoy the ride. Did you re-use the stock headlight ears? I ordered it with black turn signal bodies. The mounting brackets just make contact with the fuel tank at full turn lock to lock. You could remove a bit of material for clearance. I just avoid turning the bars that far. Avoid the mounting brackets that look like they are made from thin stamped steel if you ride at night much. Sometimes the headlight will vibrate too much. I think the reason that some exchange the gauges for digitals is usually due to either crash damage, the desire for something smaller, or they want more information available. Chances are you will need a new battery. Do yourself a favor & buy a good one. I use & recommend the sealed AGM type of battery. Preferably made in the USA. Check out Batteries Plus. The FT Ascot requires a stout battery & the cheap Chinese wet-cell lead & acid batteries usually don't last very long. Plus they vent corrosive gasses onto the bike causing corrosion. There are not very many exhaust header & muffler options available. The EMGO universal reverse megaphone will work. They come with 3 adapter collars to mate up the pipe diameter. If you go that route, buy the two-piece unit so you can remove the core & re-pack it with a better silencing material. Yes, just needed longer bolts. Had to go take a look at the OEM headlight mount. Looks like it will work. The FT Ascot that I installed the round headlight on had been lightly dumped & broke the gauges, bent the headlight mount, bars, etc. Getting closer.....she located the title and is getting her hubby to snap some pics. Man, I really don't need another project. SWORE I wouldn't take one on for a while. But....I just can't help it. My friend finally sent me some pics of the Ascot today. All this time, I thought it was the FT500. Nope....surprise! It's the VT500! Bonus...I guess? Not so crazy about the shaft drive, but isn't the VF a little more rare and desirable? The shaft drive is nice. One of the few shaft drive bikes that don't rise & fall in the back end depending upon throttle position. Did you purchase that VT500A Ascot from your friend ? Looks like it's in decent shape, what's up with it? Did you buy it? Sorry....been over on the V twin side! So much fun! Light and nimble and not too powerful. And guess what? I have a line on a thumper! Going to look at it this weekend. Scott, Did you also purchase an FT500A Ascot thumper ?